Are You A Ticking Time Bomb in the Classroom? In 14 days, $185, 471 has been raised by 7,760 people through Go Fund Me for 64-year-old music teacher Marston Riley who was arrested after punching and fighting a 14-year-old boy during class in Maywood, California. You don’t have to look far to come across story after story of teachers who are stressed out, fed up, and are on the edge spiraling to their breaking point. This is what I believe happened with Mr. Riley. We all know striking a student is wrong, but despite this disturbing act being caught on video, many students had nothing but praise for this teacher. Many said he was kind and a good guy. It is clear from the 7,760 people that donated to Mr. Riley that people across the nation understand why he snapped. How does a good teacher commit an act so wrong? How can other teachers avoid the same? The problem is two-fold. Schools have to do a better job of supporting teachers, and teachers need to know when it is time to make changes to take care of themselves. A few weeks ago, I saw the play Pipeline in Indianapolis which focused on the school to prison pipeline and the various broken parts of our education system. In this play, a teacher ended up striking a student with a broom to break up a fight. She had called for backup and no one came. How many educators across our nation are struggling with managing students? How many are fed up with the blatant disrespect hurled at them day in and day out while they are trying to produce better citizen for our society? How many educators don’t feel physically or emotionally safe in their school or their classroom? When schools lack support, teachers snap. They are human. Although I have never placed my hands on a student, I must admit I have said words I regret because I had reached my boiling point. Striking a student or uttering the wrong words can be a career ender. Teachers must know how to protect their livelihoods. For me, I had to leave a school I loved. Part of the reason I had reached my boiling point was I was sent everyone else’s problematic students day in and day out. 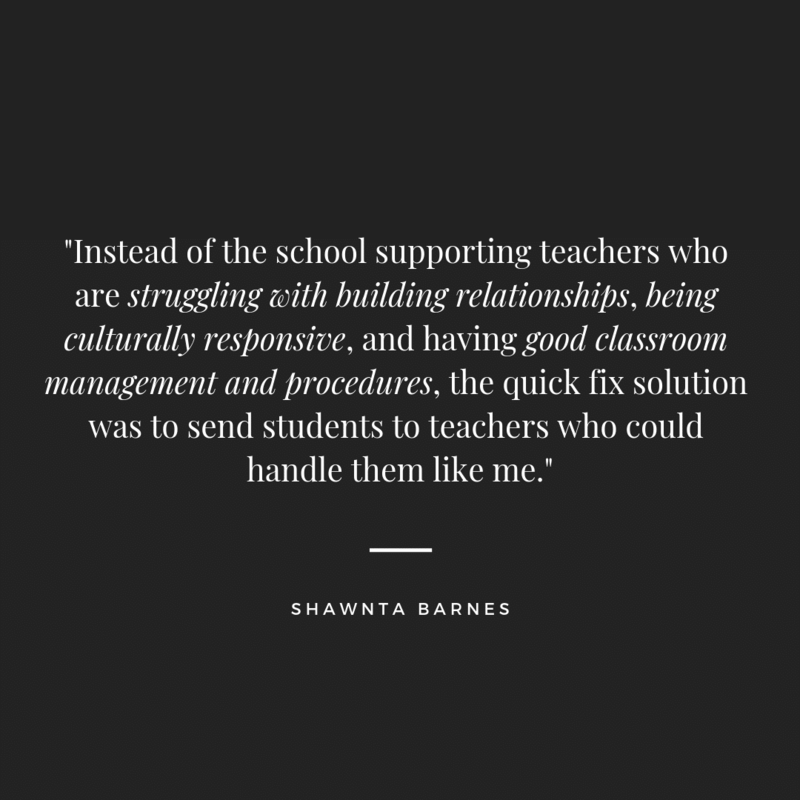 Instead of the school supporting teachers who were struggling with building relationships, being culturally responsive, and having good classroom management and procedures, the quick fix solution was to send students to teachers who could handle them like me. When teachers have to carry this load, it is only a matter of time until a good teacher goes bad. I didn’t want to become that person. If you are an educator who feels like any day you could snap, you need to take care of yourself. This may mean reaching out for support in your building or looking for a new job. This may also mean leaving the profession. For each person, the answer will be different. The main point is to know you are reaching your breaking point and act. I don’t want any more teachers to find themselves like Mr. Riley and snap. If your career has to come to an end or if you have to change schools, it should be on your terms, not because you were a ticking time bomb and you went off.